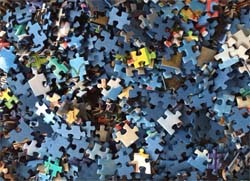 Jigsaw puzzles are a popular activity for people with dementia, and rightly so. Not only do they offer many benefits for the person, they are fun to do! Unfortunately, many people with dementia or Alzheimer's stop doing jigsaw puzzles because they find them too challenging and difficult to finish. This doesn't have to be the case. When we bring home a new puzzle and show it to the person they are excited to open the box and get started. We dump the pieces on the table and the person digs right in sorting through the pieces. They find a few that they are looking for, but then the excitement starts to wear off. They slow down in their searching, start to get distracted by other things. They lose interest in the puzzle. Is it that they aren't really interested in doing puzzles or is there another reason? The first step to success is in choosing the right puzzle. We tend to choose puzzles that are too difficult - we think in terms of 500 or 1000 pieces when we should be thinking about 20 to 100 pieces. 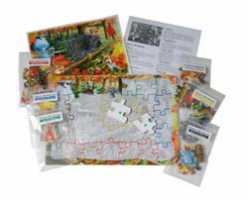 Our article "How to Choose a Jigsaw Puzzle for Someone with Dementia" goes into more detail about how to choose an appropriate puzzle. The most important consideration is to choose a puzzle that ensures that the person will be successful. Once we have selected an appropriate puzzle, presentation is key. In the past the person may simply have dumped the puzzle pieces on the table and started right in on the puzzle. Now, while they may start going through the pieces, it is likely that they will quickly become overwhelmed. As they sort through the pieces, they lose track of what it is that they are looking for - was it a building? A flower? Doing the puzzle becomes frustrating rather than fun and so they lose interest. A better approach is to presort the pieces before presenting the puzzle (or use a puzzle that comes presorted such as our Sequenced Jigsaw Puzzles). The first time you are presenting the puzzle, sort the pieces into groups of 4 to 6 pieces according to where they go. Put each of the border pieces into separate groups with one corner piece in each group (left, top, right and bottom) and divide up the middle pieces into manageable groups. When you are ready to do the puzzle, be sure that there are no distractions such as a TV or radio playing and that the lighting is appropriate and invite the person to join you. Place the left border pieces on the table so that they are oriented in the correct manner. Take the first corner piece and place it in front of the person. Give them time and see if they choose the next piece. If they don't move to choose a piece, pick it up and place it in position attached to the corner and say "Now you try". If they still don't place the next piece demonstrate again. If they still show no interest, thank them, put the puzzle away and try another time. More likely, they will pick up a piece to put in position. If they are having trouble finding the correct piece, offer them suggestions such as "Are you looking for a tab on the bottom? ", or "Are you looking for a piece with red on it?". Continue in this way clockwise around the border of the puzzle, one edge at a time. Once the border is complete, use the same techniques to fit the pieces in the inside section of the puzzle, offering only a few pieces at a time. 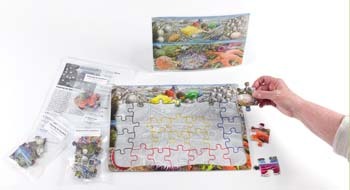 Our 35 Piece Sequenced Puzzles use a color coded tray to facilitate this. Our other puzzles use full size templates to provide guidance as necessary. When the puzzle is complete say "Good job" and ask the person if they would like to do it again sometime. As you are doing the puzzle, if you find that the person is easily placing the pieces, try putting the pieces on the table without orienting them in the correct direction. If they still can place the pieces easily, offer two sets of pieces instead of just one. Increase the challenge in this way, but only if the person is able to proceed easily. Some days the person may be able to readily sort through 15, 20 or even 35 pieces while on other days 5 or 6 may be more appropriate. It is far more important to ensure that the person is successful than to provide extra challenge. Pay attention to how readily the person is placing the pieces and adjust the level of difficulty accordingly.